Merry Christmas everybody! And best wishes for a joyous and blessed New Year! My shop will be on "vacation" until 2010! And this is probably my last post until the new year. Hard to grasp that this year is nearly over! Since I'm not doing a Wednesday Crafty Wrap-Up tomorrow, here's a shot of the new hair bow holder I made for my daughter's room. I made it out of an old picture frame, after the glass broke. 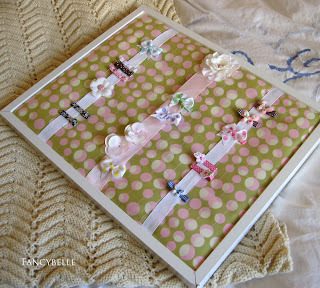 You can get a similar effect by attaching fabric over a layer of batting to a piece of cardboard. May you all be blessed this Holiday Season and may the *real* meaning of Christmas remain ever before us! Is cooking a craft? Absolutely, undeniably, it is. 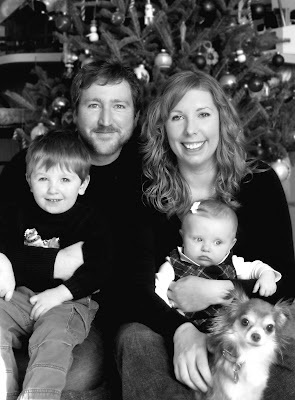 Although my husband makes dinner most every night (lucky me), I'm cooking more and more now that we have two kids. I've just started making baby food for our 6-month old daughter, and what a cost savings for minimal effort!! Here's a recipe I concocted last weekend for butternut squash soup that will please the whole family--kids included. You might already be aware of the fact that I live in Minnesota, which is known for turning into a frigid wasteland at least 6 months out of the year. That being said, it is SNOWMAGEDDON 2009 outside right now! Wind, ice, cold, snow...ugh. So let's stay inside and knit, sew, scrapbook...play on our computers...you name it. As promised in last week's installment, here are even more fun and helpful links for those who love to craft, knit and sew. There's nothing like the all-hours, multi-media convenience of online resources to help you in your crafty pursuits...so here are some additional favorites of mine! My shop, Fancybelle Boutique, is looking a mite sparse suddenly! It's actually pretty exciting in a way, because my sale on Baby Belle cloth dolls was so successful over the Thanksgiving/Black Friday/Cyber Monday shop-a-thon. I'm now old hat at shipping internationally...it's just incredible to think someone in Japan has a set of my ponytail holders! If you are looking for handknit baby legs that are ready to ship, I have three pairs that will be posted later this week. My grandmother, an incredible knitter, prepared these for the shop and added a darling little picot lacy edge to each! So cute. 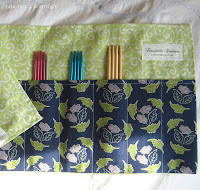 Also keep an eye out for two roll-up knitting needle cases, designed with 10 pockets for 7" double pointed needles. Ideal for that knitter on your Christmas list. Bigger cases for longer knitting needles are in the works as well, for those of you with many different sizes to accommodate. Oh, I almost forgot!! Folks have been contacting me about more Baby Belle dolls and I have about 10 ready to sew, so please let me know if there's a particular doll you're interested in. My own daughter is getting a set for Christmas and they really do look adorable peeking out of a Christmas stocking! First off, let me introduce you to my son's Christmas stocking. This holiday, I totally did NOT wait until the last minute to decide I'm making a turkey, then spend all of Thanksgiving Eve submitting said turkey to cold water baths just to thaw it out in time. No way, I never procrastinate like that! Here are some crafty highlights for you to gobble up (har!) before the craziness of Thanksgiving weekend descends on your house! Not Me! Monday! was created by MckMama, so we can share a few minor imperfections and get some laughs out of our similarities. If you want to join in, head over to her blog and link up there! I most certainly did NOT neglect to dust the house for at least 3 weeks, and then finally notice once I moved a pile of knitting needles that sat on my vanity for that same length of time because I was definitely going to use them AT ANY MOMENT...so best to keep them at arm's length in case inspiration strikes during my 5am baby feeding wake-up call. The holidays are fast approaching and I'm hoping to get a few new items stocked in my store before "Black Friday", aka the day after Thanksgiving. For sure I'll have four new pairs of Baby Belle Handknit Baby Legs in pink and purple colors and a new set of Girly Girl Baby Blocks listed in the next week. Also, I plan to make several knit hats in toddler and baby sizes for those chilly winter days ahead. I'm super excited to announce a new line of items geared to the crafty--knitters and sewers! I seem to remember hearing back in my days of Catholic school: faith without works is dead. 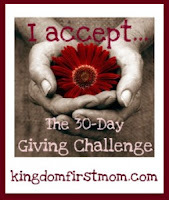 When I heard about the 30 Day Giving Challenge, I felt right away that this opportunity should not be turned down. It was one of those moments when I was alert to God whispering in my ear to pay attention and take action. My teeny-weeny shop that started from nothing just a couple of months ago has now hit twenty sales! I actually need to replenish my inventory on a few things, and that's a great step forward. My new sewing machine will be getting a workout in the coming weeks, but it's definitely up for the challenge. I've been trying it out on a few small trials and it's a revelation. Love it. 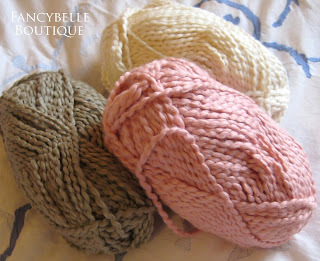 I'm so proud to announce that Fancybelle Boutique is also featuring three shades of gorgeous organic yarn for all handknit items--almond, strawberry and khaki. I'm using Nature's Choice all-cotton organic yarn, grown and spun without the use of pesticides, herbicides or other chemicals. Not only is it super soft, the dyes used to color this yarn are certified organic as well! I also have some new yarn color choices for my Baby Belle collection of handknit items--including baby legs, baby hats and ballet booties. And I'll be doing lots of knitting this week because I sold a custom order of handknit baby legs AND a pair of my new organic yarn baby legs. Love knitting these! I'm excited to participate! Check out the details here. This month I'm making a commitment to give in some way everyday and write about it here whenever I can. Write down the blessings that come your way each day, too! Yes, I have gone computerized! 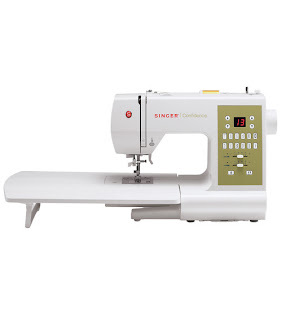 Now that I'm the proud owner of brand spanking new Singer Confidence Quilter, I can know the joy that is a 98 stitch capability. Free motion and walking feet, people! 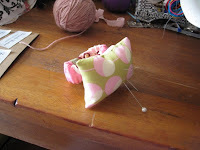 Drop and sew bobbin! 13 needle positions! 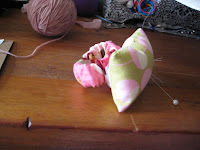 I am getting close to perfecting my new knitting pattern for baby ballet slippers. You see, Lucy Belle is going to be a ballerina for Halloween. She has the tutu already, but what self-respecting ballerina could go without beautiful lace-up toe shoes? So I've made her a pair of the yarn variety. Darling! Just this weekend I'm running a 20% off sale on my Baby Belle dolls! So, if you've had your eye on one, it's a great chance to purchase. Take care and have a fantastic weekend! 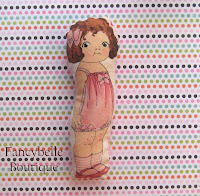 I've decided to offer a special sale price on my Baby Belle cloth dolls next week. I'm thinking perhaps 20% off! 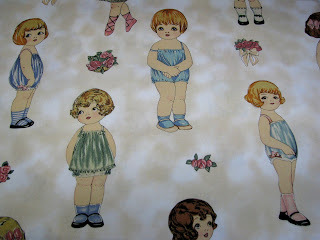 I just love making these sweet little dolls and picking out new fabric combinations for each. In fact, there might be a few new dollies to choose from in the very near future!! Sometime next week I hope to run another contest for blog followers and Facebook fans. This time I'll be giving away a cloth doll from my Baby Belle Cloth Doll collection. Excited!!! 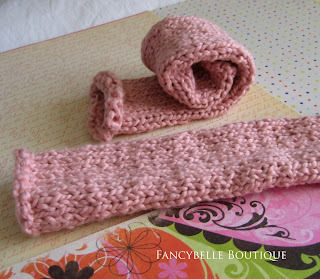 I'm also planning on adding a few handknit "babylegs"-style leg warmers to my shop by the end of October. I just finished a prototype pair to try out on Lucy Belle and I think I have my design perfected at this point and ready for the viewing public! Fancybelle Boutique is now featured on Handmade Highway, an awesome directory of handcrafters that I'm really excited about. Check out our post here! Handmade Highway is a living, dynamic directory of handmade sellers giving users 1-click access to handmade shops, products, pictures, location, seller contact info, and availability. A totally terrific resource for people that enjoy buying unique handcrafted merchandise! These have been a long time coming. I started them a month ago and just couldn't bring myself to sew all of those hidden closing seams until today. So glad I did--they look fabulous! I just listed one set of 3 baby blocks featuring petite jingle bells on the inside, for a light twinkling noise when shaken. There is one more set that I'll be listing later this month without jingle bells, but I assure you...I'm annoyed easily by noisy toys and these are not too loud, not too soft--just right! The blocks are made in a combination of popular designer fabrics, and although I made 3 sets in total (another jingle bell set for my own daughter Lucy Belle), no two sets are exactly alike. 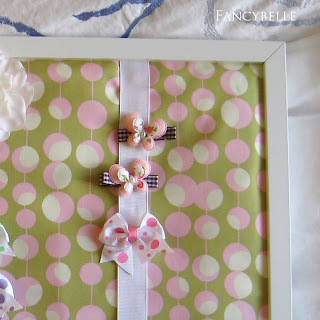 A perfect, one-of-a-kind gift idea for the next baby shower you're invited to! Although I'm still perfecting my design for this item, I hoping to offer a few wrist pin cushions for sale at Fancybelle Boutique in the coming weeks. Looks like my spinal fusion surgery is on hold until the end of the month so I'll have a bit more time to concentrate on fun projects! You can see a little peek of the jumble that is my workstation in the above photos...I didn't feel like straightening up! I do all of my work on an old library table desk that is totally piled full of sewing notions, project pieces and even a folio of scrapbooking items. Today I got closer to finishing a sewing machine cover for my trusty sidekick, my Grandma Lucy's Riccar sewing machine. I'm experimenting with some zig-zag stitching on the storage pockets...I think it's going to be super cute! Next up at my store: Amy Butler girly-girl baby blocks and a listing for Baby Belle custom handknit baby and toddler leg warmers. Some listings on Etsy for "babylegs" are just ladies knee-high socks with the foot cut off. Since I always feature custom items of my own design, my shop could offer no less than the same for babylegs! Later this week I'm expecting to receive a pattern for toddler training pants that I'm more than a little excited about! My son Zach is 2 years old and about 75% of the way towards being potty trained. Some days we run through an ungodly amount of pull-ups, so I'm thrilled to eventually own a non-disposable yet waterproof option. I love Twittermoms! 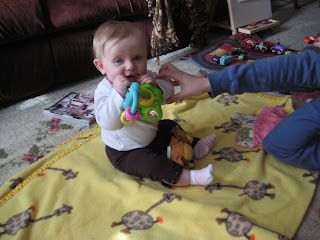 Check out all the fun blogs posts on this entry or at my right sidebar. Enjoy! 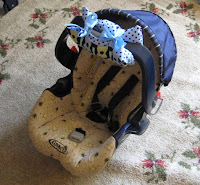 I'm offering free shipping on all car seat handle cushion through October 23rd. Please take advantage if you are interested. I also have free shipping on my baby blocks right now, and hope to add my Amy Butler girly-girl baby blocks to my store this week! Wish me luck, I'm thinking ahead to Halloween and about to start my first baby tutu! Yes, Lucy Belle, my 4-month old daughter, is going to be a baby ballerina...decked out in layers of pink tulle--hot pink, medium pink and light pink. All tied around a fuschia grosgrain ribbon. At least, I think I bought some ribbon. It's hard to remember in the haze that descends over me when I'm at Joann Fabrics (my fave store) clutching a 40% coupon in one hand and a scribbled list that's invariably missing one semi-important item in the other. 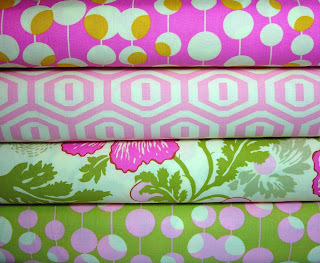 The accent fabric will be Michael Miller's Dumb Dot in cocoa...a dark brown fabric with light pink polka dots. Love it!! Lucy Belle and I might have to keep a set for ourselves. 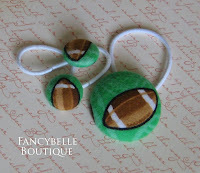 If you become a fan of Fancybelle Boutique on Facebook, facebook.com/fancybelleboutique, you'll be entered to win a set of 3 ponytail holders in a football-themed fabric! When I saw this fabric, I just couldn't resist--it really reminded me of my recent obsession with the show "Friday Night Lights"! The prize includes one large ponytail holder and two small sized ponytail holders, all in matching fabric. Perfect for mother/daughter or big sister/little sister! Contest ends this Saturday October 3rd at noon! I'm just so excited to have my Emma Belle doll featured on Gold Crest Bags recent blog post: A Doll Guide--For Every Pocket! 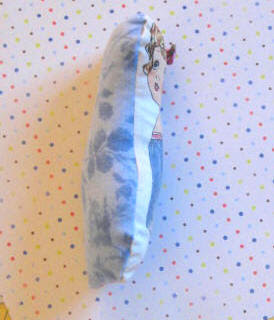 I want to thank Miriam of Gold Coast Bags for including one of my new dolls on their lovely post! 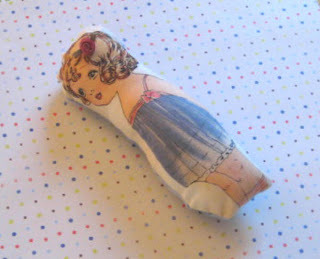 Each old-fashioned cloth doll is made from retro paperdoll fabric by Sherri Marquez and meant to be played with and given a lot of love by a very special little girl! 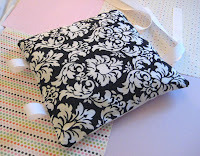 Just the right size to be carried anywhere, tucked into pockets or tossed into any sized diaper bag. Check out my store for details and more photos! New handcrafted items to be available on fancybelleboutique.etsy.com by 9/25/09! 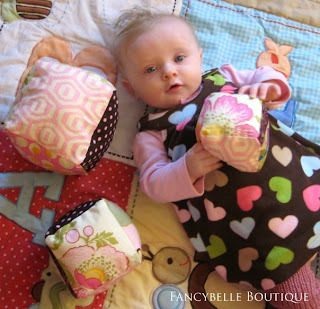 My baby model, Miss Lucy Belle, shows off one of my latest products! I just finished a set of sweet little cloth dolls made from fabric printed with old fashioned 1930's-style paperdolls, as shown above. My own Lucy Belle loves the dolly I picked out for her...just the right size for tiny hands to hold and love! Each doll is stuffed with premium extra-soft poly-fil and backed with cotton, flannel or fleece fabric. Perfect stocking stuffers for your own girly-girl! Fancybelle Boutique now has enough fans on Facebook to register a username, so if you're a fan of my shop, please let your friends know how they can be fans too! Just go to facebook.com/fancybelleboutique to sign up. Thanks!!! Thanks again to debby444 for being Fancybelle Boutique's first Etsy sale!! What a rush...I couldn't be more excited and I can't wait to send her the awesome items she ordered! 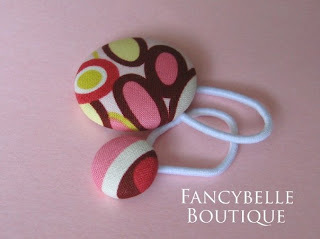 I've just made a bunch of new button ponytail holders in an assortment of gorgeous fall colors. They should be posted for sale by the end of this weekend. 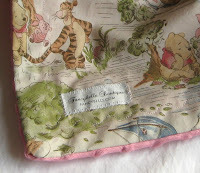 Also, several new infant carrier handle cushions will be available for sale by Monday. 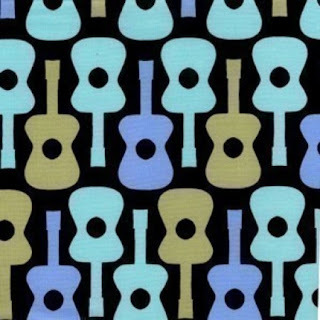 One features blue and aqua guitars on a black background, another is in a beautiful black and white damask pattern...and the rest, well I haven't decided yet! There are so many amazing designer fabrics out there, it's hard to choose. But I want you know that I'm 100% dedicated to offering a mix of gender neutral designs as well as items geared specific to boys or girls. I just finished an adorable new carseat carrier handle cushion perfect for little boys in "Groovy Guitar" designer fabric by Michael Miller and will have it for sale at fancybelleboutique.etsy.com later this week. I just love this fabric! If you have an infant car seat or travel system, then you know how much that handle can dig into your arm when you're carrying baby around. 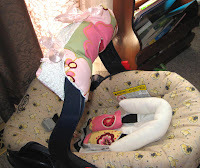 My carrier handle cushions are designed to fit any infant car seat and have just enough "squish" to protect your arm without interfering with any of the carrier handle positions. 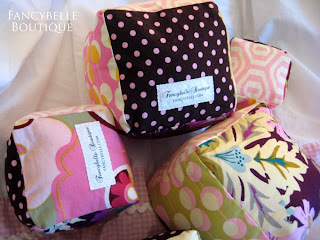 The cushion is attached quickly and easily by beautiful coordinating ribbons. I've been using mine for over 3 months now and it's never come loose from the carrier handle. 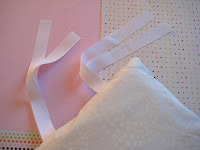 Here are some photos of my own pink Kleo cushion that we use on a daily basis. 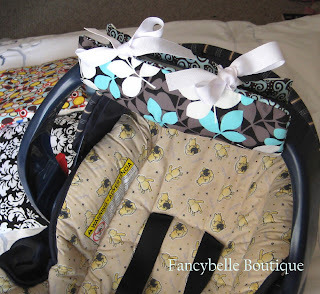 Now that Lucy Belle is getting older and paying more attention to her surroundings, she loves to look at the colorful patterns on her car seat cushion! Also on the way this week, a cuddly tag blanket for the little car lover in your family. 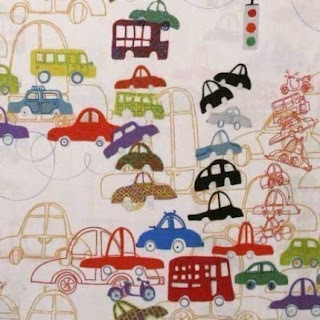 One side is soft light green minky fabric and the other is "Traffic Jam" designer fabric by Alexander Henry. Hopefully I'll sell it before my vehicle-obsessed toddler steals it away! Finally...available for purchase by 10/1/09: a set of soft baby blocks made in designer fabrics from Alexander Henry and Michael Miller. Colors include turquoise, dark red, yellow and rich chocolate. This set is perfect for either a toddler boy or a girl...or even a delivery surprise baby on the way! 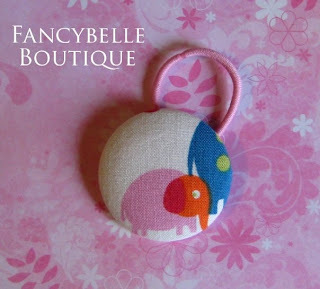 Over the weekend I just listed several new button ponytail holders made from designer fabric and a sweet little stuffed unicorn toy with a grosgrain ribbon mane. Here are a few photos! These button hair ties are an affordable and easy way to add a lot of style to a simple ponytail or braid. Prices range from $2.75-$4.00. An affordable way to indulge your sense of style. My new stuffed unicorn toy would be an adorable accent piece for a nursery decorated in an oh-so-trendy pink and brown color scheme! And it's even machine washable, if your child ends up using it as a teething toy. 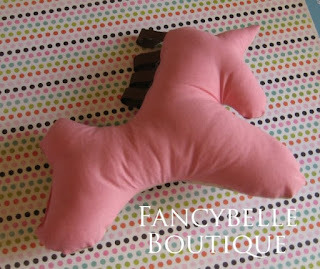 A cuddly little horsey like this is perfect for a cowgirl-themed nursery or even a shabby chic floral adult's room. 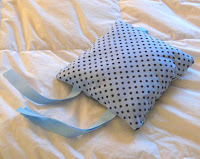 On sale now at fancybelleboutique.etsy.com for $15.95. Larger and smaller versions will be available by 10/1/09. Today I'm posting on Etsy a few of my sweet little creations from my baby hat collection! Take a look, and I hope you enjoy them. All of them can be customized with different colors or special yarn, just let me know. I love making new things. My handcrafted items make really special, one-of-a-kind baby shower gifts...no one is going to show up to the party with the same gift as you! 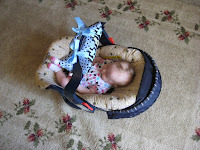 Coming soon...I hope to post some arm cushions for infant car seat carrier handles. I couldn't live without mine. Well, that might be a bit of an overstatement, but this is one of those items that you don't realize you need until get it and use it yourself. I've been using mine for 3 months and no more hard plastic digging into my arm when I carry my baby around in her car seat. And Lucy Belle has something fun and colorful to look at as well! Ours in Alexander Henry pink kleo fabric and I'll be listing several in a variety of designer fabrics for both girls and boys. 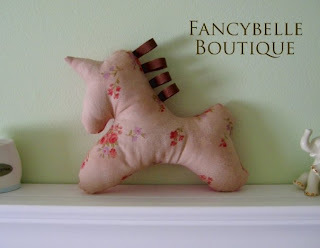 Also coming soon...an adorable stuffed unicorn horsey with a ribbon mane, available in designer fabrics. Perfect for little and big kids alike! This site will display handcrafted items for babies, children and their mommies that will be available soon at fancybelleboutique.etsy.com. 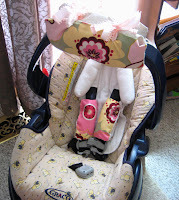 I make car seat carrier handle cushions, strap wraps, knit hats and toys for girls and boys. 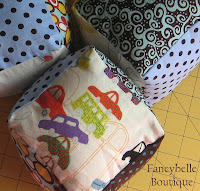 I'm learning how to make fabric blocks, baby Bjorn covers and fabric hair accessories. My own two children have inspired these creations. In fact, this store is named after my precious and lively infant daughter, Lucy Belle! But I won't forget about the boys in your life. Being a mom to a 2 year old son that is "all boy", I know the importance of quality products that can withstand plenty of washings. The majority of the profits of Fancybelle Boutique will help supplement my family's income as I transition to being a stay-at-home mom. Please come back and check my site often to see new products that will be added. Thank you so much for visiting!